They will say, nobody saw it coming. Who could have predicted it... It is worth noting that the 1932 stock market crash is deemed to be the worst in the 20th century and not the one in 1929. By mid-1930, the market was up 30% from the trough of the 1929 crash. However, by the summer of 1932, the Dow reached a low of just 11% of its high in 1929, or a loss of roughly 89%, trading more than 50% below the low it had reached on October 29th, 1929. If one had $1000 on September 3rd 1929, it would have gone down to $108 by July 8th, 1932 -- end of the worst crash -- or an 89.2% loss. To recover from such a loss, one would have to watch one's portfolio go up by 825%! After the stock market crash in October 1929, the Dow Jones Industrial Average (DJIA) partially recovered in November-December 1929 and early 1930.
. October 16, 1930: “Looking to the future I see in the further acceleration of science continuous jobs for our workers. Science will cure unemployment.” – Charles M Schwab. On July 8th, 1932 the Dow reached its lowest level of the 20th century and did not return to pre-1929 levels until 23rd November, 1954. The full impact was not felt until the next year. By 1933, the Great Depression was very real and it would take more than 22 years before the market would regain what had been lost. So severe was the impact of the 1929-1932 crash, that by spring of 1933, when President Roosevelt (FDR) took the oath of office, unemployment in the US had risen from 8 to 15 million -- roughly 1/3rd of the non-farm workforce -- and the GDP had decreased by more than 45% from $103.8 billion to $55.7 billion. Although the depression was worldwide, no other country except Germany reached so high a percentage of unemployment as the US. The poor were hit the hardest. By 1932, New York's Harlem district had an unemployment rate of 50% and property owned or managed by African Americans fell from 30% to 5% in 1935. Farmers in the Midwest were doubly hit by economic downturns and the Dust Bowl. Schools, with budgets shrinking, shortened both the school day and the school year. 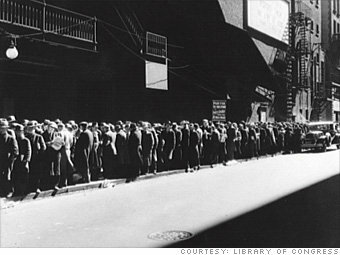 The breadth and depth of the crisis made it the Great Depression. 4. Works Projects Administration (WPA), the largest New Deal agency, was set up employing millions to carry out public works projects. However, while FDR's New Deal did help restore the GDP to its 1929 level and did introduce basic banking and welfare reforms, FDR refused to run up the government deficits that ending the depression required. Only when the federal government imposed rationing, recruited 6 million defence workers (including women and African Americans), drafted 6 million soldiers, and ran massive deficits to fight World War II did the Great Depression finally end. The extent of the economic devastation of the 1930s went far beyond the imagination of anyone in the financial markets or governments across the world.